From innovative prototype to reality: La Spaziale S15 now comes on the market. The new machine will be the protagonist at the stand of La Spaziale at coffee Exhibition TriestEspresso Expo, from 20th al 22nd October (hall 27- stand 51-53). The new proposal meets the requirements and the trends of portioned coffee in ho.re.ca. and vending market segments, which mostly require flexible professional machines combining automatic use and the action of the operator. S15 is the proper alternative to the manual use of the portafilter: it is professional and compact , with double delivery group and compatible with various capsule formats. By allowing the delivery of more cups simultaneously, La Spaziale S15 suits the context of coffee bar, hotellerie and restaurants. The solution, studied and developed by the technicians of the Bolognaise company, features for its easy use as well as for granting an optimal and always consistent result in the cup: S15 thus boasts an automatic capsule ejection system. The capsule is inserted from the top and at the end of the delivery, once used up, it falls in the collecting box placed by the delivery group. The compatibility with various capsule formats is not the only advantage of S15 which does have a practical water tank of 5,5 liter capacity, which can be easily refilled from the top. Alternatively, it can also be connected to water mains. The new fully professional compact machine – soon available on the market – boasts also a wide cup warmer, a steam wand to create a perfect milk cream for cappuccino and the possibility to select single short coffee dose, long coffee dose and the free flow mode. 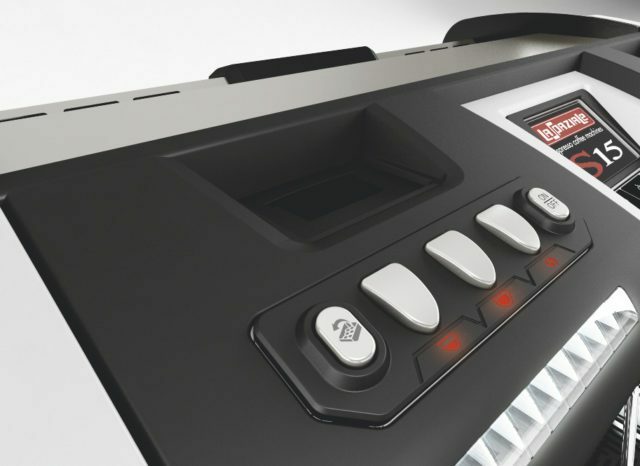 S15 is unique in its original design, with led lighting and it is also technologically advanced, with a tft 3,5” touch screen control panel and a USB connection for an efficient user interface. The company has also developed the machine so that it is fully modular: the two coffee groups and the boiler can be independently switched on/off, so as to achieve energy saving in case of partial use. For years La Spaziale has been developing different solutions for portioned coffee responding to the strong attraction that this market segment always has, even for outdoor consumption. Beside S15, La Spaziale’s latest innovation, all the espresso coffee machines produced by the Bolognaise company can be adapted to portioned coffee delivery , both in pods and capsules, with the simple replacement of the porta filter and of group shower block. Dimensions: L600 x D470 x H450 – weight: 34 kgs – power input: 230v/ 50HZ 2600wW – compatibility with the most popular capsule formats – water tank capacity: 5,5 lt – water tank manual filling from the top – touch screen tft (Thin Film Transistor) 3,5” RGB control panel – prearrangement for connection to water mains – USB interface – capsule automatic discharge after each delivery – closing safety system for capsule box – electronic temperature regulation for coffee delivery group by P.I.D – led lighting for drip tray grid – led strip lighting for the tank – hot water and steam boiler capacity: 3 lt – used capsule box capacity: about 35 for each group (full box alarm and delivery block) – cup warmer tray: capacity of about 36 cups – adjustable delivery groups (height from 70 mm to 110 mm ) – independent switching on/off of delivery groups and boiler – coffee selections: Short dos – long dose – free flow button – delivery status visualization with led strip lighting (proportionate to the preset dose) – automatic/ semiautomatic steam delivery (which can be set in the Parameters menu) – hot water delivery – resin water softening system with cyclic number control (signal for used up resins).